As you probably know, we are wild about Miller’s Signature Albums. Turns out, we aren’t alone. 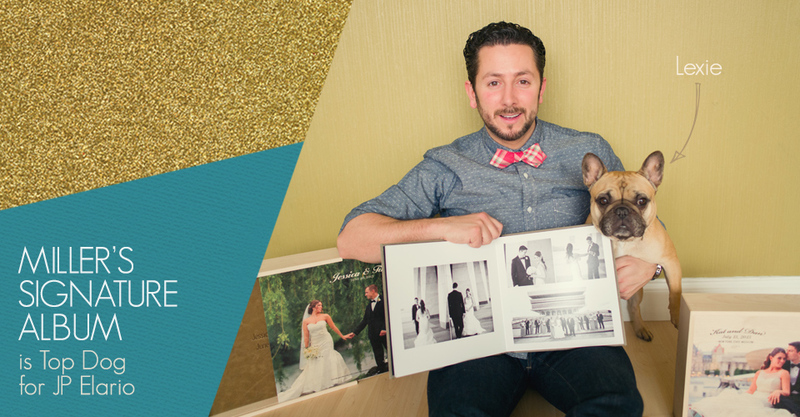 Wedding photographer JP Elario and his pooch Lexie are ecstatic about the new additions to 2013’s Hot One Award winner from Professional Photographer Magazine. We are always looking to add unique products that your clients will love. The Custom Wood Album Box and USBs have been fan favorites since they were introduced in 2013. To view more work from Elario Photography, visit their website and Facebook page. Which color distressed leather is that? Sahara? Hi there. The cover on JP’s album is Terra Distressed Leather.